1. In small bowl, place the 2/3 cup warm water and add the sugar and yeast. Stir and leave lone to proof, about 5minutes, until foamy. 2. Combine flour and salt in a bowl and use a whisk to blend together. In stand mixer fitted with flat paddle add the flour/salt mixture and add the yeast water, plus 1 cup warm water, 1/4 cup olive oil and mix until combined. 3. Switch to bread hook and beat for 10 minutes, or until the dough clears the sides of the bowl. It is okay for the dough to be sticky. Add the olives, herbs, and mix for 1-2 minutes. 4. Lightly oil a large bowl and place the dough into it, turning the dough to coat it with oil. Cover the bowl with plastic wrap and put it in a warm place until the dough doubles in volume, 1 to 2 hours, depending on how warm the room is. 5. Punch down the dough to get rid of excess air, shape back into a ball and refrigerate it for at least 6 hours, or overnight. 6. Remove the dough from the refrigerator, punch it down, and divide it in half. Turn out one onto a floured surface and, with flour on rolling pin and top of dough, roll the dough into a heart shape that’s about 12 inches by 8 inches. Transfer the dough to a baking sheet lined with parchment paper or silpat. 7. Using a razor blade or sharp knife, cut about 3 slashes on each side of the heart, in a downward angle towards the center of the heart, about 2-3 inches. Add one or two slashes down the middle. With your fingers, gently push and pull the slashes open, tugging the dough a little as you go. Try to get the holes to open to about an inch wide. 8. Repeat with the second piece of dough on a second baking sheet (or cover that portion and return it to the refrigerator to bake later). 9. Cover the dough with plastic or a dish towel and let it rest for 15 minutes. 11. Mix the remaining tablespoon of olive oil with 2 teaspoons water in a small cup. Prick the dough all over with a fork and, with a pastry brush, lightly coat the dough surface with the oil and water mixture. Sprinkle the bread all over with sea salt. 12. Slide the baking sheets into the oven and bake for 10 minutes. Rotate the sheets from top to bottom and front to back and bake for another 8 to 10 minutes, or until the bread is golden—it won’t get too dark. 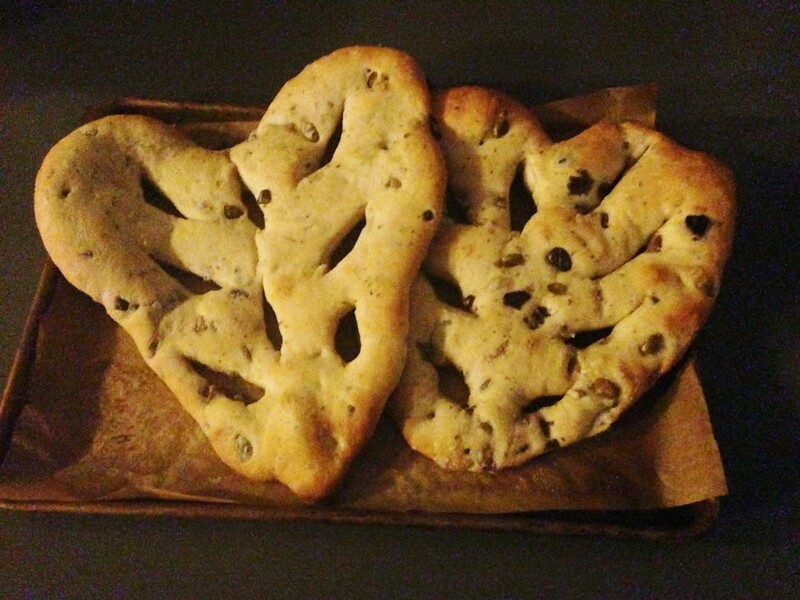 Transfer the fougasse to a cooling rack and let rest for at least 10 to 15 minutes before serving. This entry was posted in appetizer, baked goods, baking, french, yeast breads. Bookmark the permalink. I think that’s a great new take on something heart-shaped for valentine’s day. :3 It’s a nice break from the hordes of sweets!